Devils Track Nordic is a local ski shop located in Grand Marais, Minnesota and an online ski store. Check out our selection of Madshus cross country skis! No matter what you’ll use your skis for - elite racing, weekend touring, back country skiing or a ski adventure for the whole family – we have the high performance cross country skis you’ll need. Use our How to Select skis guide to determine the type of ski you’re looking for. Or give us a call and we’ll figure it out with you. 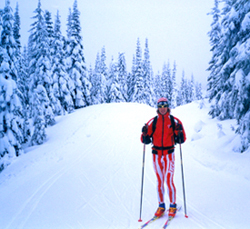 Cross Country Ski Boots, bindings, poles, wax and more. You will find everything needed for a complete ski package; cross country ski boots, bindings and poles. 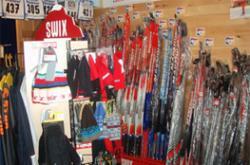 Wax, clothing, hats, ski bags- all that you need to have a great cross country skiing experience. Check out our website for great deals on ski gear! Check out the additional selections in our local shop. Located on the North Shore of Lake Superior, Devils Track Nordic Ski shop is in the heart of Midwest ski country. You can ski right out our back door onto the 25 kilometer Pincushion Cross Country Ski Trails. Our Trail Reports can give you the latest information on trail grooming and skiing conditions. Stop by and see us when you are on the North Shore of Lake Superior.